The outdoor wood burning furnace, which is also known as an outdoor wood boiler, has been around for several decades. It burns cord wood and is used primarily in competition with heating oil furnaces and to some extent propane heating, mainly in parts of the country where cord wood is readily available or the homeowner has a wood lot from which to harvest wood. 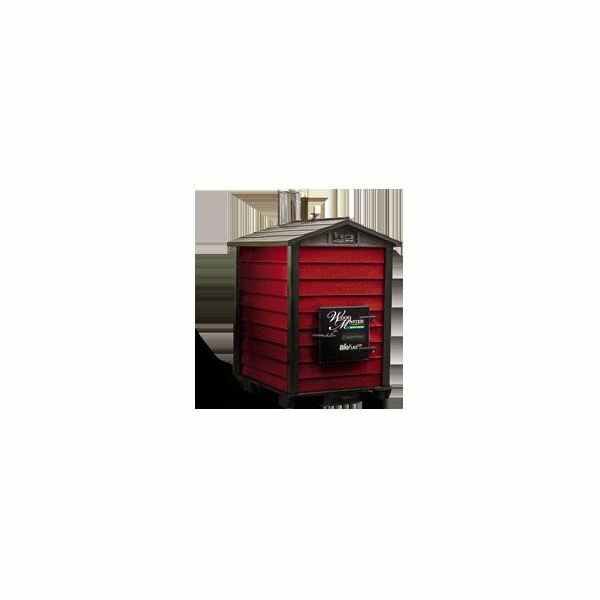 The outdoor wood burning furnace is located outside the house in a small shed, where the burning wood heats water that is then circulated into the house at a low pressure to provide heat through a central heating air distribution system. The outdoor wood burning furnace/boiler has come under fire in some parts of the U.S., especially in the northeast and northwest, because of its inefficient burning of wood and generation of smoke and odors. They are banned in some cities and towns. ‘Features and Options of the Best Wood Pellet Stoves,’ for more information about wood pellet stoves. Corn burning stoves arrived about ten to fifteen years after wood pellet stoves, introducing an annually renewable fuel. Wood pellet furnaces and corn burning furnaces soon came on the market as well. Wood pellet and corn furnaces and stoves burn their fuel much more efficiently and completely than a typical outdoor wood burning furnace. Thus it isn’t as necessary to locate the burner outside. 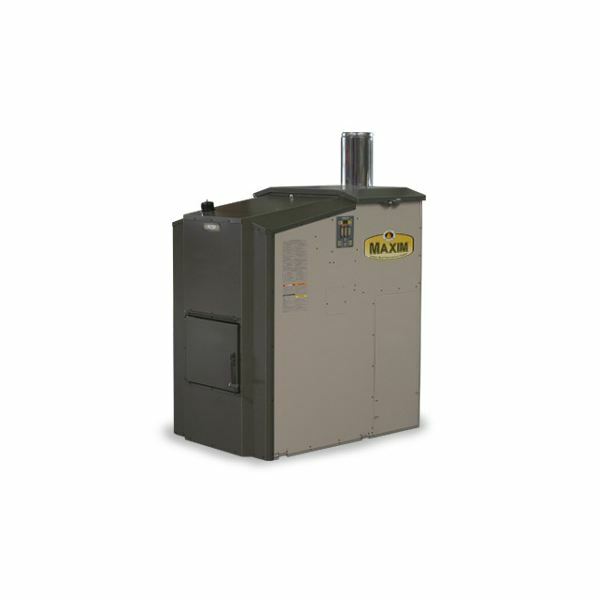 Both indoor and outdoor wood pellet or corn burning furnaces are available. Two examples of outdoor wood pellet or corn burning furnaces are the WoodMaster by Northwest Manufacturing, Inc, shown at the left, and the Maxim from Central Boiler, Inc, shown at the right. 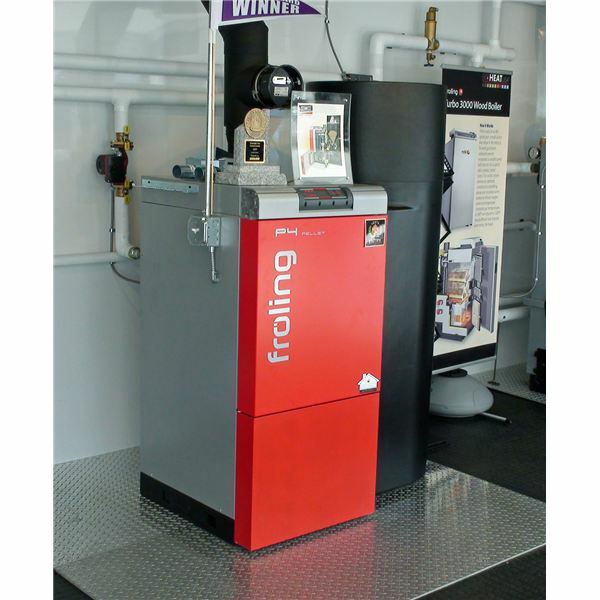 are Harman Home Heating, who have several wood pellet or corn burning furnaces, including the Hydroflex 60 pellet boiler shown at the left; and BioHeat USA, whose wood pellet or corn burning furnaces include the Frohling P4 Pellet Boiler shown at the right. Click on the manufacturer links to see more details about these indoor wood pellet or corn burning furnaces. As shown in the images, nice, sleek wood pellet and corn burning furnaces for location in the house are available. Due to the greater efficiency of wood pellet and corn burning furnaces, it isn’t necessary to locate them outdoors as with outdoor wood burning furnaces. Indoors or Outdoor Wood Pellet or Corn Burning Furnaces? As outlined above, both indoor and outdoor wood pellet and corn burning furnaces are available. Both versions have the advantages of more uniform central heating of a house in comparison with wood pellet or corn burning stoves used for space heating. Outdoor wood pellet or corn burning furnaces have the advantage of keeping the combustion process outside of the house, keeping the fuel stored outside the house, and the ability to heat multiple buildings (house and shop, house and separate garage, etc.) conveniently. 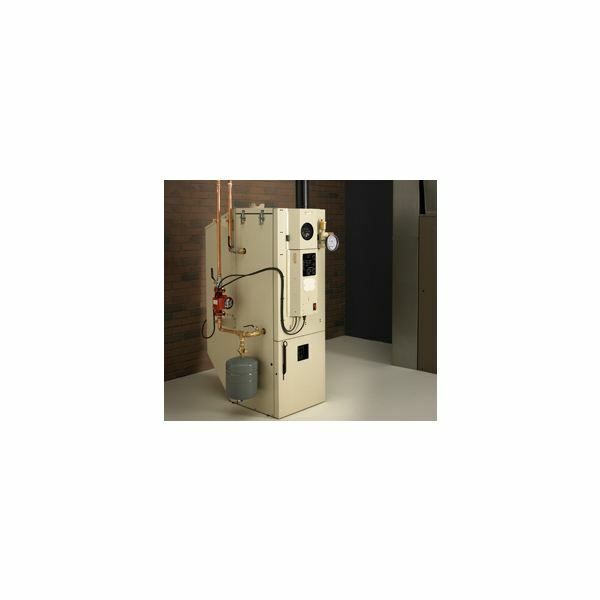 If it is to be used just to heat a house, however, the indoor wood pellet or corn burning furnace is a convenient option.